As a nation we have so much to be proud of as we enter into 2017. Our country has just been through one of the most difficult years in our recent history. Global challenges have placed pressure on our economy. Papua New Guinea, has survived the downturn in global commodity prices, which was made much worse by drought. We have also seen domestic challenges. But we overcame each and every challenge and we are a stronger country because of this. What makes Papua New Guinea great is our unity – we might be from different villages or provinces, but together, we are all proud Papua New Guineans. When we have difficulties, we people pulled together and stand strong. When we faced economic pressures, we cut our spending and managed our economy. Our people respect and understand the Government’s decisions to do this. As well as overcoming these challenges over the past year, we have also achieved a lot as a nation. Many more children than ever before in our history are now going to school. More people than ever before are receiving healthcare in our nation. We make our communities safer by putting more police on our streets, and by strengthening our court system. We are continuing to build more roads, more bridges, more airports, more ports, more wharves and other infrastructure that were neglected for many years. Life is better now in our country than just five years ago, and we will keep building our economy and develop our nation. We are also in the most stable political time in our nation’s history. In fifteen years we have only seen two Governments, and many of the Cabinet Ministers have remained intact in their positions. This stability has led to increased respect around the world. In the coming year we will go to National Elections. Regardless of politics, we will go to elections as one country, a very vibrant democracy and a people who care about our nation. Together as a nation united, we can achieve so much. In 2018, our country will become the host of APEC. Over this time more than ten thousand people will come to our country from around the Asia-Pacific. APEC will bring with it the opportunity to improve important sectors in our economy such as tourism, agriculture and fisheries. This will help small businesses and create more jobs. The world’s attention will be on Papua New Guinea with the Prime Ministers and Presidents of APEC countries coming to our land. This will be a proud time and it will continue to change how the world sees our nation. Papua New Guinea is a country that is changing, and we are all part of this change. From a nation of villages, we are becoming a modern and proud nation in the space of a single generation. 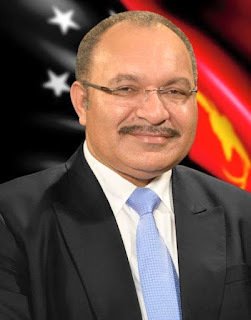 Around the world, Papua New Guineans are representing us in business and Government. Today we have pilots flying the biggest jets in the world, our scientists are leading ground breaking research and our engineers are working on massive projects in many parts of the world. We have so much to be proud of, with the change we are seeing, but we also have a lot of work ahead of us. Every man, every woman and every child in Papua New Guinea must benefit from this change as our country develops. You have our commitment that as your Government will work to make sure all Papua New Guineans continue to benefit from this change. Please stay safe, look after your families and your communities, and let’s work together so that we can build a stronger Papua New Guinea in 2017. Have a Happy New Year Papua New Guinea.